The reasons why we should educate ourselves, our children and our future generations. Everyone believes that, "if we, North Borneo state of Sabah and Sarawak ceased from the Formation of Malaysia that has being agreed in the Malaysia Agreement 1963, other country will take advantage on Sabah Sarawak and will caused a war". Because that's how the rumours being spread to the natives of North Borneo since our great great grandparents still alive. And since our great great grandparents are not well educated enough about laws and political studies during that time, it makes some group of people happy with our past generations lack of knowledge or education, and they are trying their best working on limiting our education and knowledge. We are too comfortable with ourselves, get entertained by gadgets high technology nowadays, and being served with various movies and reality TV show, which caused us irresponsibility towards our nation. We cannot continue living our life being selfishly, just try to improve our own selves, and just think about how to pay our bills, and how to refills our kitchen pantry's food stocks. We are responsible for our future generations. The people of North Borneo Sabah Sarawak need to have at least basic Law Studies to avoid others to take advantage on us, especially when it comes to our rights. How Malaysia being Form in 1963, where it is being agreed between the Malaya, Singapore, Sabah and Sarawak is trough International Law. And since the Malaysia Agreement 1963 being violated, all the 20 Points Of Agreements never being fulfil for more than 52 years, the "Equal Agreement" that never happened is Void. From the International Law we followed the procedures to form Malaysia, and from International Law shall we follow the procedures to ceased and claims our rights. (SSU-UK) registered and recognised internationally, founded by Doris Jones, to fight for North Borneo Sabah Sarawak rights through United Nation, and get the British government to review the validation of Malaysia Agreement 1963. During the process of collecting the 300,000 sign petition in Sabah , some volunteers being caught by the police in Tuaran and Lahad Datu district under the Sedition Act 1948. Federation of Malaysia being Form in 1963, which is means that the Sedition Act is never valid for it is only being use and recognised during the British colonial in Malaya before Malaya gain their independence on 31 August 1957. This kind of disruption caused by the Malaysian government's ordered to stop the petition being collected from the people's voice, can be accused under the Human Rights Act in International Law. There are few more disruption try to stop SSU-UK activities, such as the group named by SSBKM (Sabah Sarawak Bantah Keluar Malaysia). This kind of unauthorised group also can be accused under the Human Rights Act, for trying to stop the people of North Borneo to fight for their rights. "It is the legitimate authorities that will take place for the safety of North Borneo Sabah Sarawak since we followed the International Law procedures, and it is the same procedures being followed by the Singapore when they ceased from the Formation of Malaysia in 1965. Military support for Sabah Sarawak will be set for few years for the border, security and safety of North Borneo, before they can manage to incorporate and possess their own Armies." 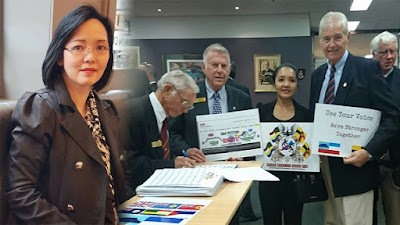 And for Malaya, please don't forget the history where the Malaya also getting military support from Australia during the 2nd World War, attacked by the Japan and took thousands of Australians armie's life, Lest We Forget! The world are aware with what is happening in North Borneo Sabah Sarawak nowadays. And most of the people around the world believes that Sabah Sarawak should get justice from the violated Malaysia Agreement 1963 for more than 52 years of Discrimination and Prosecution under the governance of Malaya. But most of the natives people in Sabah Sarawak are afraid to claim their rights because we have been brainwashed for more than 52 years, most people not knowing the procedures how to claim our rights through a proper channel using International Law and through United Nation. Fighting within Malaysia caused the person threatened by the government for the Malaysian Law mostly will backups and protect the government. We, the people of North Borneo Sabah Sarawak have the rights to accused the Malaysia government for violated the Malaysia Agreement 1963, like how the Singapore suing the Malaysia government in the High Court in Singapore under the provisions of the Government Proceedings Ordinance, 1956, of Malaya as extended to Singapore by the Modification of Laws (Government Proceedings and Public Authorities Protection) (Extension and Modification) order, 1965. How can the leaders of Sabah Sarawak allowed the Malaysia government to Modified the Laws that being agreed in Malaysia Agreement 1963? We need to educate the people of North Borneo Sabah Sarawak and our children, for knowing what is happening because this is effecting our future. We are not slaves and we are not supposed to be colonised, again. We have many educated leaders in Sabah and Sarawak, yet it takes courage to fight and claims our rights, against the discrimination and prosecution tortured by the Malaysia government towards the natives of Sabah Sarawak. For the Malaysia government never wish an intelligent born in North Borneo Sabah Sarawak who can fight for our rights, just educate our children anyway, for we should never live in a lie. If you understand and know how the Malaysia government breaching the Contract for more than 52 years, and you as the natives and the real citizens of North Borneo Sabah Sarawak believes that you should have Humans Rights, we should stand up together, because people from another country believes that we should get our justice. We should stop the unlawful caused by the Malaysia government, and get our justice from the International Law. Sign the petition today, before it is too late for our children to change in the future, the possibility of changing the future that we should responsible to take action today, from our past mistakes. 100% agreed and fully supported.